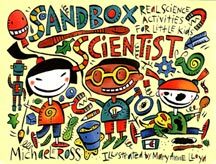 I wrote Sandbox Scientists to celebrate the playful explorations of young kids and to turn adults on to the amazing scientific skills of the children in their lives. I had been teaching science to kids of all ages for many years, but I realized that the younger the child, the less they were interested in direct teaching and the more they were bent on simply messing about. Was there science in their play? Through my eyes as an adult scientist I examined their play. I presented them with kits of materials, such as a rock exploration kit or a water drop kit. Almost immediately when they were presented a kit, the kids would start to play. I took notes and made more kits. I watched my son and his friends at home, I watched kids at the child development center, and I watched them in a kindergarten/first/second multi-grade classroom. The more I watched the more amazed I was. The science explorations of little kids put adults to shame. They are open, spontaneous, and fun. They are real science. is a guide to setting up and watching a developmentally appropriate science program in your home, day care center, or school. Try some of these kits and see what happens.